The postwar art museum has increasingly served as a site of artistic intervention, whether through sanctioned forms of institutional critique (Fred Wilson’s pointed rearrangements of the collections at the Maryland Historical Society and the Seattle Art Museum, for example) or unsanctioned action. Museums like the Kolumba (the former Cologne Diözesanmuseum) have taken note, juxtaposing their medieval and modern collections in an attempt to lend older art a frisson of novelty and to speak to the postmodern mal d’archive. In a similar vein, this small show at the Art Institute of Chicago (running through August 28, 2016) frames the museological archive as an archaeological site, ripe with potential finds. 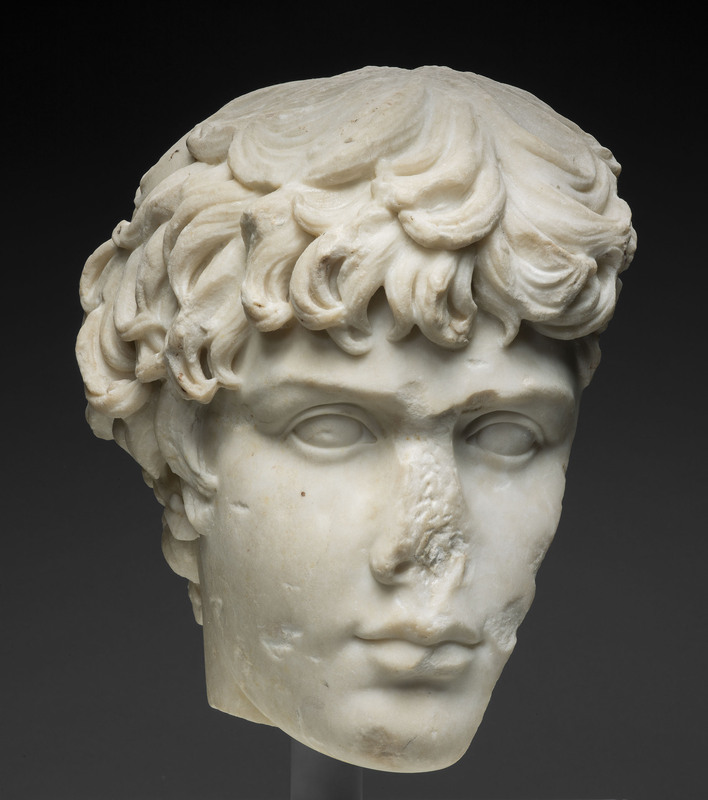 The find in question is a fragment of a mid-second century marble portrait head of Antinous, Hadrian’s teenage companion whose untimely end in 130 CE sparked an unprecedented wave of memorialization (below). Controversially deified after his death, he was repeatedly rendered in a distinctively individuated style. The Art Institute’s fragment, comprising most of his face and his distinctive curls, typifies this wave of production. It entered the museum’s collection in 1922 after being removed from its original bust and remounted as a quasi-bas-relief. A fine example of imperial carving, it compares favorably to a slightly earlier bust of Antinous as Osiris presented here as comparison. 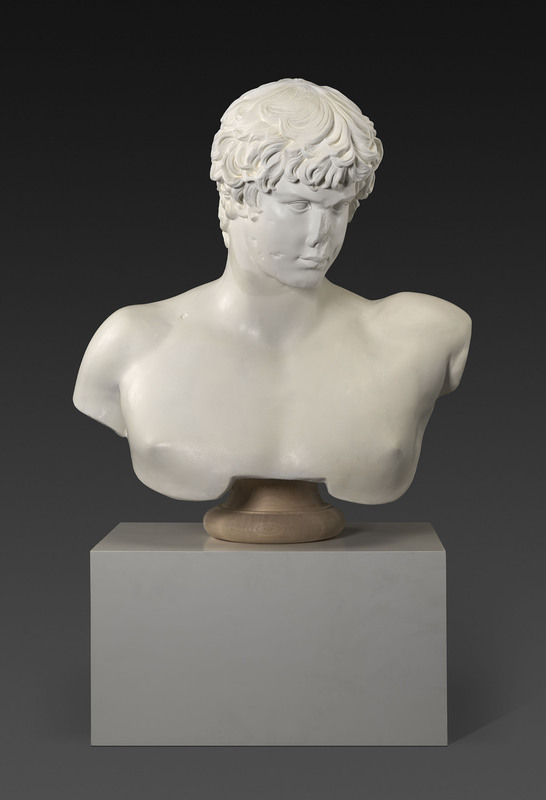 About a decade ago, scholars noted the fragment’s similarity to a heavily-restored bust of Antinous in the collection of the Palazzo Altemps (below). The Altemps work features an eighteenth-century face stuck awkwardly to a second-century head, the join between old and new sculpture clearly articulated by a line running down the cheek, under the jaw, and across the tousled locks. A battery of tests, supplemented by the wizardry of 3-D printing and laser-scanning, determined that the Art Institute’s fragment had, indeed, been lopped off the Altemps bust at some past point. The museum is not wrong to claim this as a significant discovery. In a rare turn, we can examine the particularities of a story too often told in generalities, for the long life of a Roman sculptural object, ravaged by time, taste, and restoration, gets some real specificity. Although it’s unclear exactly when the bust and fragment parted company, their rich modern biographies are telling. They show us, for example, how early modern collectors broke apart ancient objects and recontextualized them according to their tastes. They show us how one statue could multiply into two, how a bust could beget a bas-relief which could turn into a more explicitly orphaned fragment. How an English (probably) sculptor could sculpt a facsimile of Antinous’ visage in the eighteenth century (probably) for a faceless bust thanks, no doubt, to the obsessive antiquarian collection of Roman medals and statues. The stories of the sculptures’ early modern afterlife—not to mention their susceptibility to contemporary analysis—are bound up with Hadrian’s relentless imaging of his dead companion in a recognizable, replicable form. The curators have smartly used the show to reflect on the conditions that enabled the objects’ reunification. (Unfortunately, however, they eschew any critical reflection on those conditions’ limits or negative consequences. To my mind, this is a missed opportunity to engage thorny questions of method, collecting, institutional practice, and display, to name but a few issues occluded by the show’s occasionally triumphalist tone.) The captions, wall text, and object selection frame the fragments in a story of connoisseurial sleuthing and trans-Atlantic technological gumption. A large portion of the exhibition space is given over to a long video replete with interviews. Differently-scaled models and prints of the Art Institute fragment and the Altemps bust surround the objects. One model, marked by the glossy sheen of contemporary facture, recombines them in a spectral approximation of how Antinous would have appeared before its dismemberment. A selection of ancillary objects—including a portrait of Charles L. Hutchison, the Art Institute’s first president who also purchased the fragment—attempt to place the fragment with respect to the taste of fin-de-siècle American collectors, while other ancient and early modern comparanda help contextualize other key moments when the objects were altered. Luke A. Fidler is a PhD student in the Department of Art History at the University of Chicago.